Cassiodorus Senator (c.490-583) was a Roman statesman and writer, who, after retiring, became a monk at the monastery of Vivarium, which he founded on his own land, in emulation of the monastery of Monte Cassino, founded some years earlier by St. Benedict. At the end of his public career his letters were collected and published, and they circulated in the Middle Ages in manuscripts such as this, despite the fact that modern critics have tended to see little value in them, stating, for example, that 'pompous digressions . . . form the basis of these compositions'. This manuscript was at the Convent of Austin Friars, York, by the 14th century. 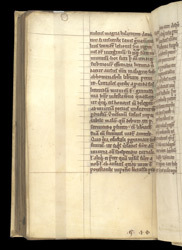 The quire number at the in the lower right margin of this page is unusual for several reasons. Not only is it a very early use of Arabic numerals, but it is written from right to left. This is the last page of the 16th quire, so the numerals '.6. .1. .0.' are to be read as 016, or 16.